I completed the second day of my presentations at work today. 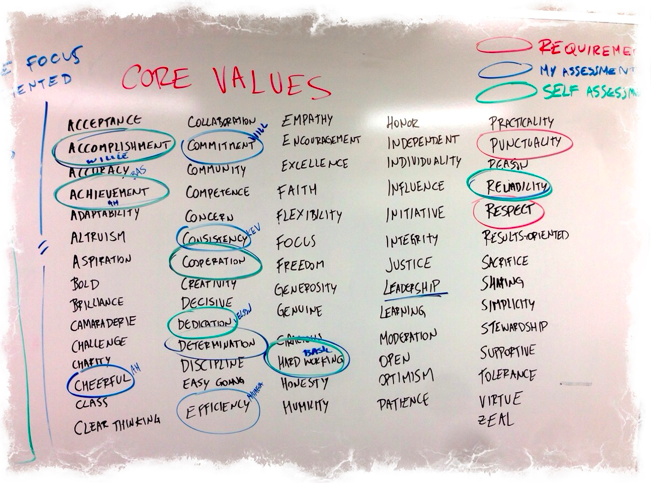 I arrived an hour before the meeting and wrote a long list of core values on the board. It was not meant to be all-inclusive. It was just a way to invite conversation. Based on input from my boss regarding what he feels is a work requirement, I started the meeting with two items already circled in red: RESPECT and PUNCTUALITY. I went around the room and used a blue marker to circle of values I can observe in each individual. I tried to make this step as thoughtful as I could and provided examples. For example, one of my employees shows a real passion for living. He is always smiling and as far as I can tell he has never had a bad day at work. For him I circled CHEERFUL and explained how that helps those around him, focusing on how that helps me. All activity is monitored by our servers and another key employee always hits his targets. He knows what the expectations are and he is extremely CONSISTENT. I explained how that makes him very easy to manage and a pleasure to work with. Some of the responses were very surprising and the group really put some thought into the answers. Two people approached me later with extended lists and I think overall participation was good. The group also performed exceptionally well. I wrote down all the responses and put in the context of what we discussed in the previous day: what is important to you. I am going to revisit when I compile individual goals later this year (part of something I read in “The One Minute Manager” . At the end of the meeting I gave them a little preview of tomorrow’s ten minute talk: Company Values. I also touched base on something else I plan to address in the upcoming weeks with them: Company Mission. In day one I got to know the group a little better. By asking them what is important to them, I actually learned the names of their loved ones, hobbies and long term goals. I found out where some of them plan to go on vacation next year and even share some of my own dreams. Geoff Colvin said that trust is the pillar of top-level teamwork. Reciprocal vulnerability is the beginning of trust. I wrap this up tomorrow with part 3.